Amazon doesn’t want to pay their ‘fair share’. 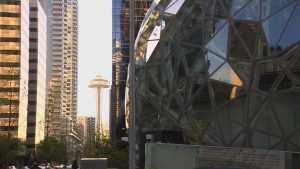 Amazon is flexing its muscles making its opposition known to a proposed Seattle tax by bringing a halt to all planning on a massive project scheduled for construction in Downtown Seattle, and may tweak its plans to occupy a new downtown skyscraper. “I can confirm that pending the outcome of the head tax vote by City Council, Amazon has paused all construction planning on our Block 18 project in downtown Seattle and is evaluating options to sub-lease all space in our recently leased Rainier Square building,” says Amazon Vice President Drew Herdener. The proposed “head tax” would apply only to those companies with $20 million or more annually in taxable gross receipts as measured under the City’s Business and Occupation tax. The city estimates that will be 500 businesses, including Amazon. Those businesses would be charged 26 cents per hour per employee up to $500 maximum per employee per year. Amazon would pay more than $20 million under the proposal, according to the Associated Press. The tax is expected to raise $75 million per year, which the city says 75 percent would go toward affordable housing. The Block 18 project at 7th and Blanchard is expected to house thousands of Amazon employees in the new 405,000 square foot building. The company had also leased the entire 722,000 square feet of office space inside the future Rainier Square skyscraper but now says it will also explore subleasing the space instead if the tax goes forward.